IndianaArtisan.org is looking for art and food enthusiasts to volunteer behind the scenes April 4-7 at Indiana Artisan Marketplace, the state’s premier fine art and food event, at the State Fairgrounds. Volunteers, 18 and older, are asked to work 4-hour shifts doing a variety of tasks, including greeting guests, selling tickets, answering questions, helping Artisans load-in or pack up, staffing the Artisan store and booth sitting. In return, each receives free parking, admission and T-shirt. In addition to more than 150 booths, demonstrations, food and wine sampling and live music, this year’s Marketplace will include a gallery of work by artists affiliated with VSA Indiana, the state organization on arts and disability, as well as a Preview Party from 7-9:30 p.m. April 5 that will benefit VSA. Plus, Indianapolis interior designer Chip Kalleen will furnish and decorate a model dining room and bathroom with Indiana Artisan work. For information, contact Ros Demaree, Rosalyn@IndianaArtisan.org or (317) 964-9455. 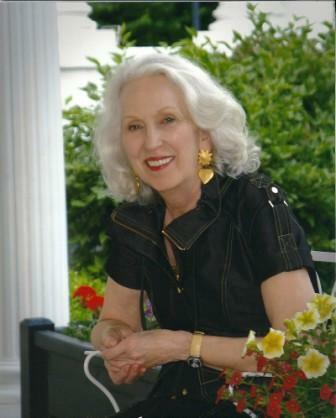 Elizabeth J. Musgrave is a syndicated fine-living, travel columnist, freelance writer and photographer, and performing arts and restaurant critic for Gotta Go. Read Infused, her spirits, wine & beer lifestyle column, at www.GottaGo.us and www.FoodDigital.com and catch her as Indy’s Entertainment Adviser on 93 WIBC. Gotta Go is published on www.Gottago.us, www.BroadwayWorld.com, an in print. Follow her on Twitter @GottaGo, LinkedIn and Facebook. Chef Greg Schiesser from Indiana Downs, takes home another culinary award. This go-round is the top award from Taste of Elegance 2013 held February 5 at the Indiana Roof Ballroom in Indianapolis. Schiesser's winning entrée was candied pork belly with bacon infused goat cheese. The chef was presented with a check for $1,000 from Indiana Pork. He will represent Indiana at the Pork Summit hosted by National Pork Board in Napa Valley, CA. 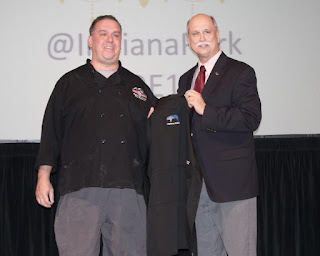 Annually, chefs from across Indiana compete in the prestigious event, hosted by Indiana Pork in partnership with Indiana Farm Bureau, Indiana Soybean Alliance and the Indiana Corn Marketing Council to encourage chefs to use pork more frequently in creative, non-traditional ways. Indiana wines are paired with the dishes and served to attendees throughout the evening. Schiesser continues his innovative ways with cooking and canvas classes in the fall and a 5-Course Tequila Pairing Dinner on Friday, March 22. The dinner will be hosted at 7 p.m. in the 2nd floor of the clubhouse. Call 317-421-999 to reserve a place. Schiesser also won the Taste of the Southside Chef Challenge February 24. During two sessions, the competitors had 30 minutes to prepare a dish with mystery ingredients. Chef Greg’s mystery basket included alligator, quinoa, kumquats, summer squash and montenebro cheese. He presented a pan-fried alligator with citrus kumquat quinoa, roasted sweet pepper fondue, and baby arugula and pickled summer squash salad. Other competitors were defending champ Richard Goss from Richard’s Kitchen and Brick Oven Pizza, Donovan Koester of Augustino’s Italian Restaurant, and Mike Heller of Main Street Grille. What's better than supporting a local writer? Supporting a local writer who is donating 100 percent of her book sales to Indy Reads, that marvelous nonprofit group teaching Central Indiana how to read. Author, public speaker and philanthropist Lorene Burkhart has decided to give back to her community ~ again. This time around, the Indianapolis pillar has partnered with nonprofit group Indy Reads. What's Indy Reads? Just a little ole group of individuals who are lot like that little bitty ant climbing the rubber tree plant. They have high hopes. The organization dares to believe that it can make a difference. A difference in an area that is difficult to fathom in this day and age. Seriously...doesn't everyone know how to read? More years ago than I would care to admit, I was on the original Project Literacy group in, where else, the Ozark Mountains. Our goal was to teach adults how to read and write. Fast forward a few lifetimes to today's adult. Illiteracy is a thing of the past ~ right? Illiteracy it still a very real problem. Little Johnny and Janie aren't getting left behind, technically. They are graduating... or at least passed on the the next higher grade. However, and this is just a tad bit important... they don't necessarily learn reading, writing and arithmetic. Some folks want to help them accomplish what the majority of us take for granted ~ the ability to read their children's report cards, the newspaper, a job application. You want to help, right? But... reality is what it is... you have a full-time job, kids of your own and, well, a life to tend to. No problem. There's a solution. Burkhart and Indy Reads have a book signing March 14, 5-7 p.m. at the bookstore, 941 Massachusetts Ave. It's free to come, sit awhile, hear the author speak and then... buy a book written by the Hoosier storyteller. Heck, buy a couple or three of them. She will sign the books, then (and this is rather amazing...) she will donate 100 percent of the proceeds right back to our super hero illiteracy-busting group. Just like that... you've helped and can get back to the soccer games, dinner together and your boss while feeling rather proud that you truly helped in a practical way which means just as much as the volunteers who sit down with the Central Indiana adults. I will stop by and hope you will stop in also. Buy those books, say hello to Lorene and give yourself an ever-so-slight smile knowing you did the right thing. 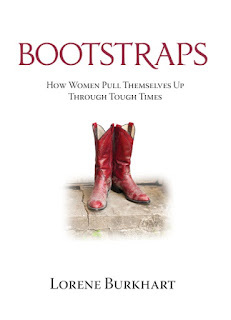 Burkhart’s newest title, Bootstraps: How Women Pull Themselves Up Through Tough Times, features the inspiring stories of 20 women who found themselves facing adversity and how they overcame these circumstances. In 2010, Burkhart published Sick of Doctors? A Prescription for Patient Empowerment with information and stories designed for patient healthcare education. Her first two books, Home on The Farm: If Chickens Could Talk and An Accidental Pioneer: A Farm Girl’s Drive to the Finish, chronicle her perspective on family farm life. For children, Burkhart has written Animal Tales, a fact-filled book of animals from around the world, and the Raccoon Tales series, two fun board book adventure stories. Indy Reads exists to teach adults in Central Indiana to read and improve their literacy. With more than 1400 students and 800 volunteers, the organization strives to make Central Indiana 100 percent literate. 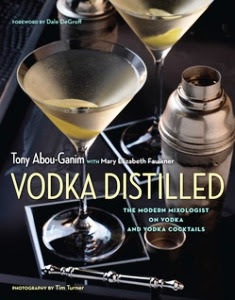 Spirits expert and author of "The Modern Mixologist," Tony Abou-Ganim, pairs up once again with Mary Elizabeth Faulkner to produce an intensive guide for vodka lovers and novices alike. "Vodka Distilled" gives an in-depth look at the world’s oldest distilled spirit. History, comparisons, and detailed instructions on distilling processes bring the enthusiast up to speed. Ordering vodka properly is made easier with an increase in knowledge base of grains, national styles and flavor properties. Abou-Gamin wills the reader to know – and care – enough to delve into the quality and choice of vodka used in their drink, whether served in a cocktail, on the rocks, or neat. The guide contains a section depicting 58 vodkas complete with tasting notes, drink suggestions and cost divided by main ingredient: Rye, Wheat, Potato, Mixed Grains, Corn and Others. Like a peppery taste? Try the rye vodka created by Belvedere out of Zyrardow, Poland. The four-time distilled vodka’s spicy and vegetable nose, along with its acidity, makes it the perfect pour for a Bloody Mary. Are vanilla and caramel more to your liking? Corn vodka by Rain Organics of Frankfort, KY, is your new vodka option for those salted chocolate caramel martinis. In the mood for a straight up martini garnished with blue cheese stuffed olives? Order the potato vodka Blue Ice – with its earthy nose and citrus palate, you will feel sophisticated with knowing your liquor. Recipes for classic cocktails like Mudslide, Cosmopolitan and Harvey Wallbanger are given, along with expert advice on the best vodka for maximum drinking pleasure. Glassware is taken seriously – as it should be – by the charismatic mixologist. The proper barware can definitely enhance the drink’s flavor, as can choice of ice. Tidbits such as this can be found throughout this bible of Russia’s favorite drink. It is possible to learn more about vodka in the time it takes to read this book than in your entire over-21 life. No longer will you overlook or under appreciate the clear liquid. It will become your go-to guide from here after. I predict that vodka will follow the path of wine, beer, and now bourbon, in being recognized as a spirit worthy of snobs, but still enthusiast friendly. Bottom Line: "Vodka Distilled" shakes, stirs and mixes the spirit’s history, varieties and brands with classic and modern recipes in an enjoyable, reader-friendly style and should be in the hands of every bartender – home or professional.